The War Outside was hands down one of my favorite reads of the year so far. It was so beautifully written and the characters were perfect. It was such a powerful and important novel! I love reading historical fiction, but I typically stick to adult novels for that genre. I was pleasantly surprised by The War Outside and I thoroughly enjoyed all of the little details that made the novel feel so real. The novel is told from two points of view. 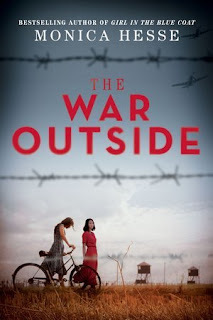 Haruko and Margot are young ladies who moved to an internment camp with their families. I think the two point of view gave a special something to the novel because the reader was able to see what the camp was like for both girls and their families. They were able to build this terrifying and unstable world for the reader that was real and heartbreaking. This was definitely a darker read, but one that I thoroughly enjoyed. The War Outside is a heartbreaking tale about bitterness and betrayal, as well as friendship and love. I would highly recommend this to readers who enjoy historical fiction. I was very impressed with Hesse's writing and look forward to reading more from her in the future. Thank you to The NOVL for sending this book in exchange for an honest review.